I didn't do very well on my list this week, but I did get a lot of other things accomplished. 1. Make a practice block for Lynne's Hexalong. I thought about it but didn't do it. Maybe next week! 2. Cut charm squares for the Rainbow Charm Square Swap. My color was purple. Cut, packaged and shipped to Jennifer. Yeah! Here's what I sent. I accidentally ordered two separate yards of this one, so one for the swap and one for me! Yippee! 3. Work on Tutorial for Joanie's bag. Finished but not ready to post. It needs some editing. 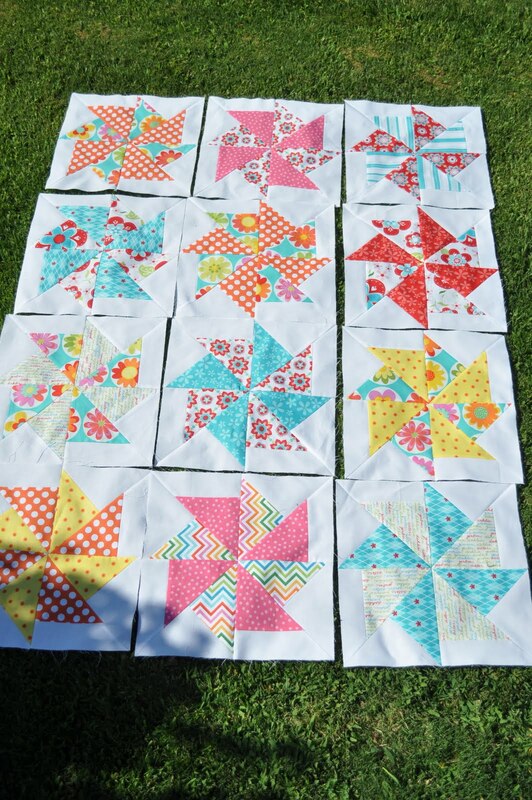 Here are 12 blocks finished, any ideas for sashing and borders? Should I make 4 more squares to make it 4x4? The blocks are 12" finished. After seeing this photo I think it needs some rearranging and maybe another red block. I think block 2 and 4 need to be swapped around. Here are the 4 rows all together. 6. Check to see if I already have the Swoon pattern, if not order it. Don't have it, so I ordered it. 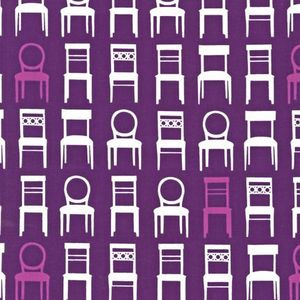 And I ordered this fabric to make it. 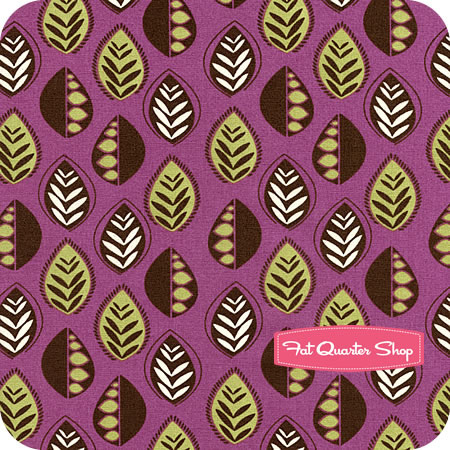 The pattern calls for 18 fat quarters. Here's 13, Joel Dewberry's Heirloom in the Citrine colorway...any ideas what would go with it? I need 5 more fat quarters. 7. Make a camera strap. This one goes to the bottom of the list again.Hopefully to be made soon. I've been collecting text fabrics. Here's my latest additions to the stash. And I also ordered these lovelies from Purl Soho. All but the bicycles were 1/2 price! Yeah! I've been doing a lot of "secret sewing". Be sure to come back to visit tomorrow. I start my month long Blogaversary celebration! I'd definitely make more of the pinwheels to make the total 16! The colours are lovely! You have been very busy! God, you make me feel tired just reading about all that work! 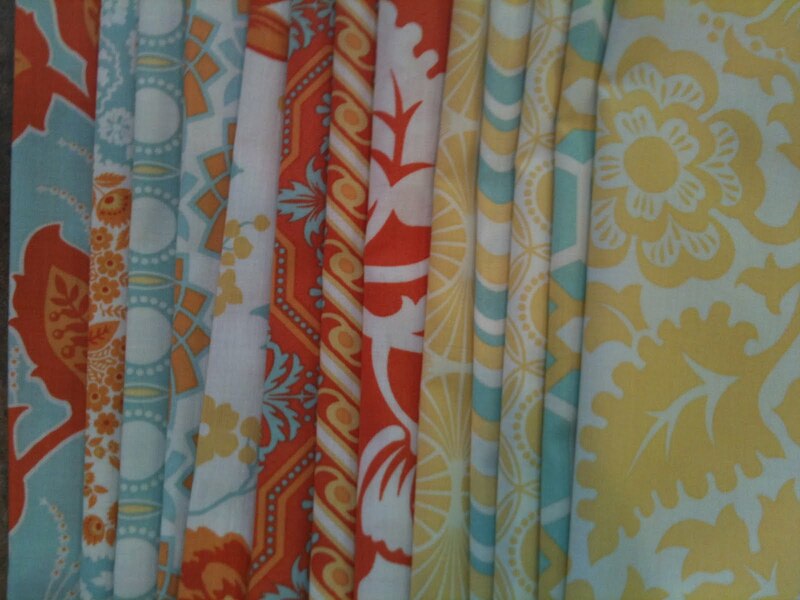 The pinwheels are lovely - what are the fabrics? The quilts look so fabulous, i dont think you need anymore pinwheels unless you want a bigger quilt which may be handy as bubby gets older, i have been offline for a while and scrolled through all your beautiful photos those sunflowers are spectaculuar! You did lots last week Diane - can't think how you can possibly think you didn't! You put the rest of us to shame. Love, love, love the pinwheels and the quilt with the grey background. That's a colour I would never think of using and it's so effective! The quilts look beautiful - I love the text fabrics! love the gray you used on those rows! They look great. Oh my goodness you had a busy week. Love the 13 FQ you ordered. I'd add some solids. I agree with you on the Round Robin Quilt. I'd move blocks 2 and 4. Wish I could get stuff done like you do in a week. Your pinwheels are great! 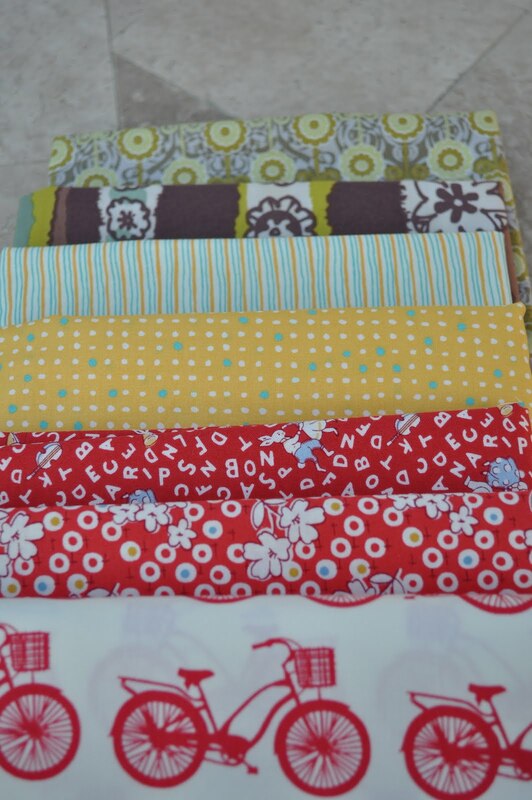 Love the fabrics you have too, you've been busy. Love your pinwheels blocks, they are so bright and fresh. Can't wait to see the finished quilt! I love your blocks, so happy and bright! And your Rockin' Robin is soooo cute, one of my favorites!! I love the quilt block pattern you have used for Baby Carrot's quilt. What is the name of that block, or where can I find the pattern? What a busy lady! So glad to see that you don't get to everything on your list though... makes me feel better about my huge UFO list!!! Love your pinwheels. They're very sweet! 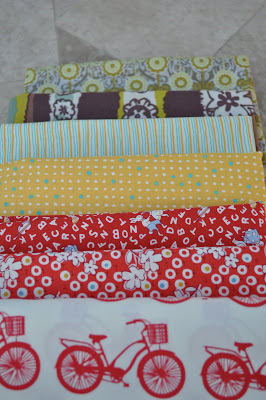 Pin wheel quilt should be next on my to do list, the colours you have used are gorgeous. I like the 3 by 4 layout but of course more blocks mean bigger quilt means longer use.